If there’s one thing we’ve learned through playing live music at weddings in Rock My Reception, is that is every wedding is unique. Of course, they all share similarities in the actual structure of the day- i.e. ceremony, reception, wedding breakfast and evening function. But certainly every couple make sure to put their own stamp on the occasion, making their wedding day special to them. For Judith and Chris, their wedding will always stand out for two reasons. Firstly, it happened to be on the same day of the partial solar eclipse which, in some parts of the country had a 90% covering, and on our way to the venue me and Kieran parked up to get a good view of the rare spectacle as the sun cut through the clouds in an eclipsed smile, the sky darkening to an eerie overcast shadow. The second reason Judith and Chris’s wedding will be rememberable is for a particular element of surprise: all family and friends had been lead to believe that they would be attending a naming ceremony for their daughter, yet they had kept the fact that they would also be getting married a complete secret from everyone! The expression on the guests faces was priceless! But, getting back to the venue itself, they had chosen the beautiful Newton Hall, a Georgian boutique hotel situated a few miles North of Alnwick, Northumberland. Rock My Reception made the journey up the A1 to discover the stunning venue, which blended the splendour of the buildings original decor, with a modern stylish function room. The venue also had views of the North East countryside with Bamburgh Castle visible in the distance. The staff were particularly friendly and helpful and the Master of Ceremonies, complete with a kilt, gave warm and enthusiastic announcements to the congregation. Not surprisingly, all the hard work and highly professional attitude of the staff at Newton Hall is paying off as they have a staggering 200 wedding bookings for 2015! As Judith walked down the aisle we played The Waterboys’ ‘How Long Will I Love You’, ‘Little Things’ from One Direction for the signing of the register and Jack Johnson’s ‘Better Together’ to lead them out to. At the end of the wedding ceremony the registrar proceeded to conduct the naming ceremony for. This involved a ‘Sand Ceremony’ whereby the family each pour different coloured sands into a jar signifying their unity, as a single entity, blended from each members individuality. A touching moment I am sure everyone will remember. 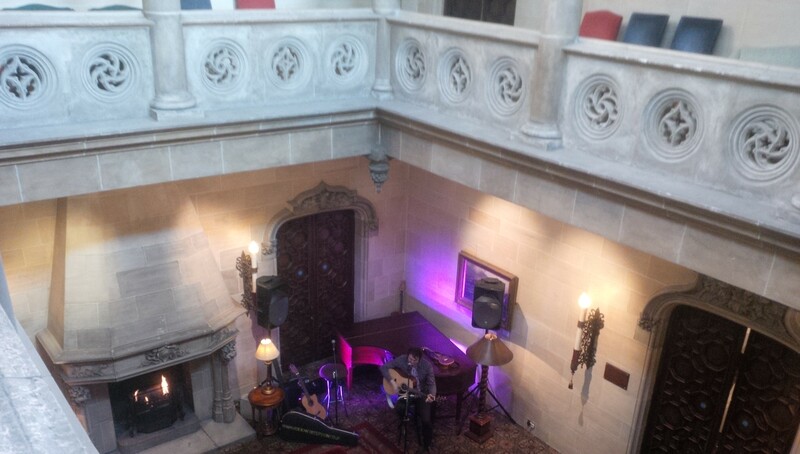 We also played the afternoon drinks reception and were inundated with some great requests ranging from Paul Weller’s ‘Broken Stones’, to ‘Hey Ho’ by the Lumineers. As an extra touch, we asked the couple if they would like us to introduce them into their wedding breakfast to All You Need is Love. They thought this would be a great idea and as we did, fountains of dry ice exploded on the bar: a vibrant and joyous entrance for the couple and their newly confirmed family unit. 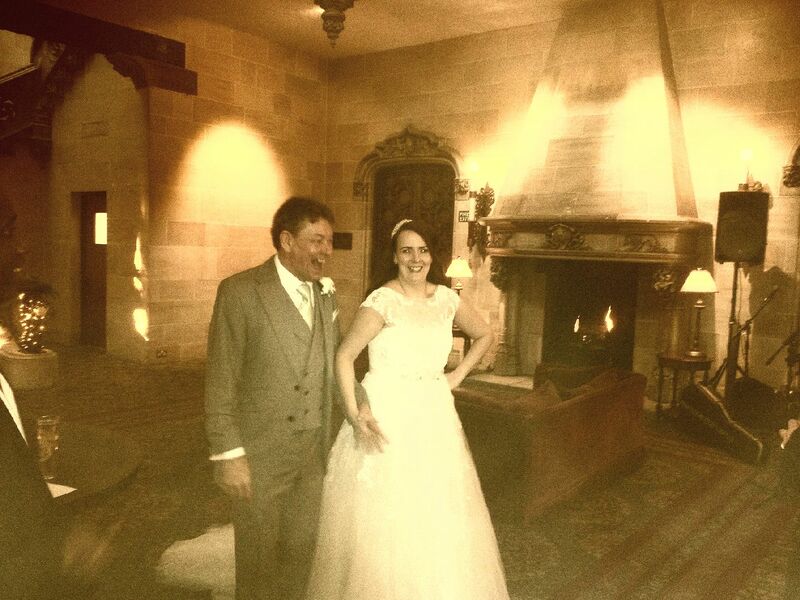 One of the questions we often get asked in Rock My Reception is ‘Do you remember every wedding you’ve ever played’? Well, if truth be told, after playing well over 100 weddings in the space of two years-some of which returning to the same venue- memories can get somewhat muddled! There are however, special details that always make each wedding stand out from one another; the sparks which make every couples big day unique. For the British public, Saturday 11th April 2015 was the day that 72,000 people watched Many Clouds storm in 1st at the 168th Grand National at Aintree. In Dunblane, crowds were gathered to celebrate their local and national hero, ex- Wimbledon champion Andy Murray marry his long-time partner Kim Sears. It was exactly 100 miles South East from Dunblane at Cuddystone Hall, Kirknewton, in Northumberland that we arrived for the wedding of Emma and Alex. After the recently welcomed April heat-wave we had enjoyed in Yorkshire over the previous few days, the Northumberland climate certainly did it’s best to let us know that summer was still yet a pipe-dream and the imposing, snow-tipped hills only added to this stark reminder. You quickly forgot about the change in temperature when surveying the incredible surrounding countryside and the cosy, inviting Cuddystone Hall venue. It became apparent that this bracing fresh air, accompanied by an early morning snow storm, was just as an important consideration as the astounding beauty of the location itself. This was a wedding venue chosen with care and astute planning, as was the whole day. Emma had the foresight to liaise with Kieran in great detail via e-mail, explaining our role in the days proceedings and what music should be provided and when. This was a great help to us as we could prepare and rehearse our parts to perfection. Emma and Alex had chosen to have their service conducted within the stone wall which houses a monument for the fallen in World War II, just across from the Cuddystone Hall. As we had arrived a good two hours early, we had set up a power supply and speaker so that the chosen ceremony music could be heard. We had already been greeted warmly by Alex and his best man, Dan and knew that this was going to be a wedding with an emphasis on energy and enthusiasm. When Emma made her way from the wedding car to the strains of The Sound of Music’s ‘ Processional Maria’, she proclaimed at the top of her voice ‘IM GETTING MARRIED!!’. The congregation cheered with gusto! It was the perfect photo opportunity as just after Alex and Emma had swapped their vows their spaniel came bounding over to join in the celebrations! As the couple and their guests made their way to the house to the sound of Sigur Ross’s ‘Hoppipolla’, we too convened to the stage in the hall. Wedding breakfasts for musicians can often be a low key affair; gentle background music being the general proviso. Emma, Alex and their guests, however chose to keep up the energy at all times. It is worth mentioning at this juncture that their caterers were outstanding and everyone was raving over the perfectly cooked steak meal. We were inundated with brilliant, up-beat requests ranging from Neil Young’s ‘Keep On Rocking In The Free World’ to ”Common People’ by Pulp. The atmosphere was turned up even more when a guest called Ken (famous for appearing on Come Dine With Me) asked if he could join us on the stage with his own Cajon box drum he had brought. Not only did we have Ken joining us on percussion, then Emma handed guests tambourines and shakers, so we treated everyone to a selection of Irish traditional sing-alongs. Emma really got everyone singing and clapping along, which made this one of the most fun wedding breakfasts we’ve ever had the pleasure of playing! As an additional twist, Alex and Emma then donned aprons and served everyone fresh ice creams as we played Chas and Dave’s ‘Hotshot Tottenham’ for Spurs supporter Emma! After the speeches, Emma and Alex took their Spaniel for a walk and we reconvened for the evening set. For their first dance choices Alex and Emma had chosen ‘ It Takes Two’ by Marvin Gaye and Kim Weston and ‘I’ll See You When I Get There’ by Lou Rawls. Both of which were great, upbeat songs that got everyone on the dance floor. Ken joined us again for most of the evening on his Cajon box drum which added to the folky feel of the set. Not only did both Emma and Alex have superb taste in music, but so did their guests and it was because of their song requests they never left the dance floor for the two hour duration of our set. The wind may have been whistling around the Northumbrian fells outside, but thanks to Emma, Alex and their congregation, inside Cuddystone Hall was an atmosphere of warmth and spirit we shall certainly never forget. Playing in Rock My Reception, nowadays, takes us far and wide. Indeed this year we have weddings spanning the length and breadth of England, from Alnwick to Cornwall. We love travelling and it’s always an added bonus to see parts of the country you may not normally get around to visiting. However, it’s nice occasionally to play on your home turf and catch up with some familiar faces and on Monday 23rd March we did just that, playing for the newly wedded couple James and Rhia Seers. James and Rhia had opted for a more low key wedding starting with a ceremony Huddersfield Town Hall, then relocating to The Woodman Inn at Thunderbridge with family and friends for a midday reception for which we’d been booked to play. 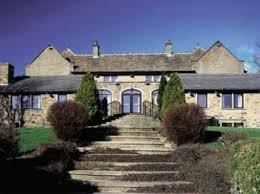 The Woodman Inn is situated in the small hamlet of Thunderbridge, 4 miles south of Huddersfield. An idyllic setting for any wedding as well as serving cask ales and real ales from local breweries. We’ve had the pleasure of playing at The Woodman for various occasions including corporate fuctions, birthdays and even a New Years Day party. Rhia and James had also brought their two young children so Postman Pat was definately on the song list as well as many other children’s favourites such as ‘wheels on the bus’ and ‘row row row your boat’. We’d never even realised there were so many verses! The adults also requested some indie classics and Rhia and her friends took to the dance floor when we belted out Steps ‘reach for the stars’. We played for a good 4 hours until James and Rhia set off for their honeymoon with their children at Centre Parks. This was a great example of how a wedding can be informal, yet still retain the splendor and atmosphere of a full scale wedding. Rhia looked stunning in her dress, the venue was a five star rating establishment with 1st class food and James and Rhia had also hired a photographer to capture the afternoon. Even the sun managed to make a rare appearance! The perfect picturesque Yorkshire Pennine wedding reception. If there’s one thing thats a priority for many couples about to get married, it’s the wedding venue. The whole physical backdrop for that big day. Its no big surprise therefore, that we get a lot of feedback on our website regarding some of the beautiful scenic buildings and gardens we get to perform at. We came to realise that we had more than enough photos of ourselves playing, and that perhaps by showing some of these grand venues we could perhaps help and inspire a couple with their own choices. 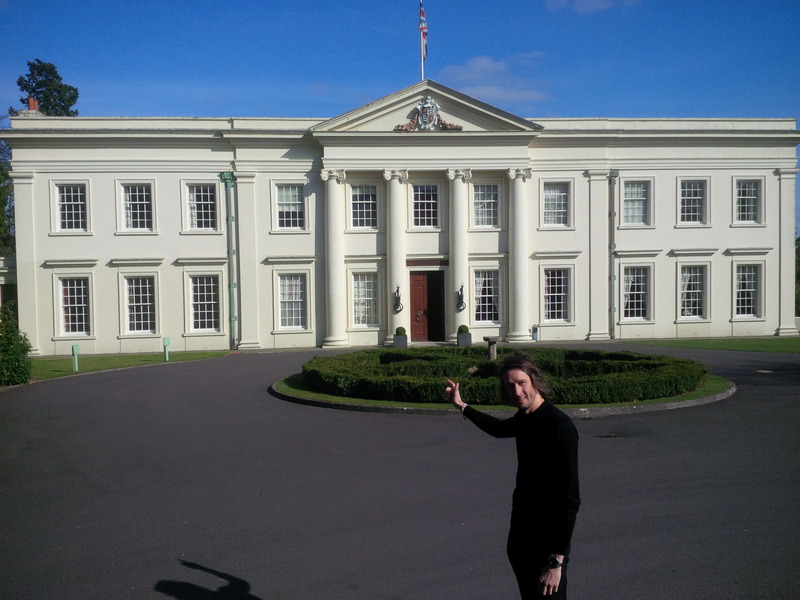 One particular venue we played at on Sunday 22nd March 2015 was Northcote House in Ascot, Berkshire. We packed our acoustic guitars into the car and travelled down from Yorkshire the day before and stayed in a nearby town, ensuring a good nights sleep and a stress-free arrival to the venue. Upon our arrival we were greeted by a splendid Grade II listed, Neo-Georgian Mansion, lit perfectly by the morning sun. Northcote House was designed by Capability Brown and nestles among 65 acres of woodlands, rolling lawns and a mirror flat lake, sporting views stretching across the Berkshire countryside. Perfect for wedding photographs. 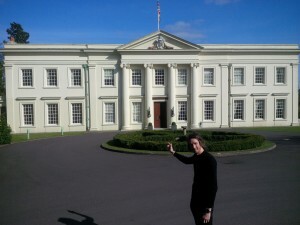 Kieran remarked that he expected to see the president strolling round corner, such was the mansions similarity to the White House! 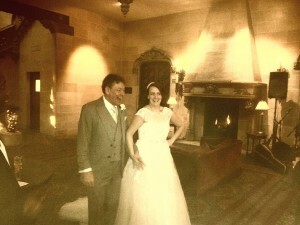 As we assembled our equipment we met the bride to be Sarah-Jane and her parents. Immediately, we could tell that the wedding would be a joyous and laid back occasion as they were all relaxed, friendly and in great spirits. Sarah-Jane had also chosen some great tracks for the ceremony: ‘I can’t help falling in love with you’ by Elvis, The Power of Love’ by Frankie Goes to Hollywood, ‘Hallelujah’ by Jeff Buckley and to walk out of the ceremony, ‘Somewhere over the rainbow’ requested specifically to be played on the Ukelele. We played for 90 minutes during the drinks reception then two and a half hours for the evening function whereby we kicked off the night by playing Sarah-Jane and her husbands first dance, Billy Joels’ ‘Always a woman to me’. The guests were also brilliant to play for and kept coming over and handing their requests for us to play. One of particular note was ‘Barbara Anne’ by The Beach Boys for Sarah-Janes mum, which she got everybody up dancing to! Not only was it a pleasure to play for their families and friends, but to chat to them afterwards. A thoroughly warm crowd and a beautiful setting, on what was also, thankfully, a sunny day in March!